Mr Henry James Wells standing outside the Rose Inn where he stayed from 1912 to 1916. (Obviously not outside for that time though). A similar shot of The Rose Inn. Rose Inn date circa 1904. Above picture kindly sent by Stuart Kinnon, showing the "Rose Inn" on the right, and the "Wellington Hotel" on the left of the church. Postcard taken 1918. There have been many guesses concerning the origin of this one so let us spend a minute looking at local history. We know that Challice kept a forge on this corner, outside the town gate, up to 1613 when he moved to another world. The gate itself was taken down in 1752 and some say that the "Rose" was built or rebuilt after that removal. Part of the adjoining town wall still standing in 1827, was removed that year. That led some to believe it was done so that the "Rose" could be built. New Street dates from 1783. It is also recorded that four years after the gate disappeared a stone was inserted into the wall of the pub to mark the spot. There are prints in possession of Dover Museum which give the impression that it was built on 'stilts' for want of a better word, with steps leading up to it. When its successor closed in 1973 it was said to be nearly one hundred and fifty years old. So, having digested all that, I can now assure you that the pub was kept by Cleveland in 1805. When auctioned, in May 1859, together with its so described excellent yard and outbuildings, it realised £870. The house number will vary over the years. The low numbers started from this end at one time. From the Dover Telegraph and Cinque Ports General Advertiser, Saturday 25 August, 1838. Henry Cloke, labourer, aged 19, was charged on Tuesday, by Martha Moore, a young woman of 18, servant at the "Rose Inn," with violently assaulting her on Sunday night. It appeared that the prosecutrix, accompanied by another young woman, was returning from Capel; and between 8 and 9 o'clock, when within a quarter of a mile of Dover, the prisoner, whom they had previously seen on the road, came up; and after an observation or two, seized the prosecutrix; and throwing her down in the hedge, proceeded to take liberties with her. She screamed murder; on which he put his hand on her mouth, and swore he would cut her throat if she did not hold her tongue. The prosecutrix, however, to use her own words, was as strong as the prisoner, and scratched his face, the marks of which were visible against him. Her companion, on his commencing the attack, ran towards the town for assistance; and meeting two young men who had heard the cries of murder, they hastened to the spot. As they approached, the prisoner got up, and ran into a field of barley, out of which he was seen to come next morning at half past five. The prisoner admitted his being in the field at that hour; but said he was returning from a walk. He also denied the charge, saying they were mistaken in the person, and that he went to bed at home, on Mount Pleasant, at the time stated. His witness failed to prove this; and after the bonnet, shawl, &c. of the prosecutrix were produced as evidence of the outrage she had been subjected to, he was committed for trial. From the Dover Telegraph and Cinque Ports General Advertiser, Saturday 24 February, 1844. Price 5d. An inquest was held at the "Rose Inn" on Wednesday last, before G. T. Thompson, Esq., coroner for the Borough, on the body of Judith Laws, aged 65. Mrs. Mary Austen being sworn, deposed - On the 19th of Dec. last, about 6 o'clock in the morning, the deceased and Mrs. Stubbersfield and myself were going along Folkestone Road, to work at Mr. Carter's, on Priory Terrace. When opposite the New Church I heard deceased, who was a few steps behind, call out, and saw that she was sitting on the bank. On going to her she said she had hurt her foot, and I then discovered that her leg was broken. I went and called my husband, and we removed her to her house. Mr. G. E. Rutley, surgeon, stated - I was called to attend the deceased on the 19th of Dec., and found her leg fractured, attended by great haemorrhage, which, after some hours, I succeeded in stopping. I then dressed the leg, and attended her until her death on Sunday last. I attributed her death to the injuries she received from the fall. The jury returned a verdict to that effect, and stated that the footpath, being dangerous, ought to be lowered and levelled. Mr Elias COULTHARD - transfer of licence of the "Rose Inn." Dover Petty Sessions. Mr Elias COULTHARD, landlord of the "Rose Inn" - notice of marriage to Louisa Charlotte WOOD, daughter of Mr James WOOD of the "Fountain Inn," Dover. From the Dover Telegraph and Cinque Ports General Advertiser, Saturday 24 October, 1846. Price 5d. Permission was granted to Mr. Elias Coultard to carry on the "Rose Inn" until transfer day. Mrs Elias COULTHARD of "Rose Inn" - birth of a daughter on 3 Sept.
From the Dover Express and East Kent Intelligencer, 28 January, 1860. Christopher Manson, was charged with being drunk and disorderly and breaking a pane of glass, value 7s. 6d., the property of Mr. T. E. Petts, the landlord of the "Rose Inn," Cannon Street. Mr. John Coulthard said he was at the "Rose" on Saturday night at 8 o'clock, awaiting the arrival of the omnibus, when the defendant, who was drunk, came in and addressed two other men standing in the bar. He appeared to know both men, as he called them by name, and, making use of very bad language, asked them if they were not going to give him some beer. The men he addressed said, "No, I won't give a blackguard like you beer." After a few other words had passed between them a scuffle took place, and the defendant, while in the set of striking one of the other men, drew his hand back and ran his elbow through one of Mr. Petts's windows. By the defendant - I did not see the younger man first interfere with you by striking you. I saw him go behind his father, but he did not commence the affray. Mr. T. K. Petts said he was landlord of the "Rose." He saw defendant in his house on the preceding evening, but he did not see him break the glass. The value of it was 7s. 6d. The defendant, in answer to the charge, said he was first interfered with by the other men, and as this was the cause of the accident he had refused to bear the whole of the damage. At the time of the occurrence he had offered to pay half; and he appealed to Mr. Petts for confirmation of this statement. Mr. Petts said he believed this was so; but he had declined taking half the money, thinking that defendant was liable to pay the whole. he Mayor confirmed this opinion, and said it was of no consequence how the row commenced. Defendant's hand had broken the window, and his common sense should have informed him that it would have been better to pay the money. As it was he had incurred the costs of this proceeding. Fined, the damage 7s. 6d., and in default commitment to prison for seven days. From the Dover Express and East Kent News, Friday 22 July, 1949. When a local man was fined for stealing a glass from a public house, Dover Magistrates on Friday complimented Sgt. Reid on his prompt action on arresting the man after he noticed him carrying the glass in the man street late at night. The man, James Murray, of Squires Way, pleaded guilty to stealing a pint glass mug from the “Rose Inn,” Cannon Street, the property of Herbert Osbourne Morrison, on July 7th. The Chairman (Mr. G. D. Clark) announcing a fine of £1 said the Bench hoped it would teach defendant a lesson, and others as well. From the Dover Express and East Kent Intelligencer, 9 June, 1871. Price 1d. 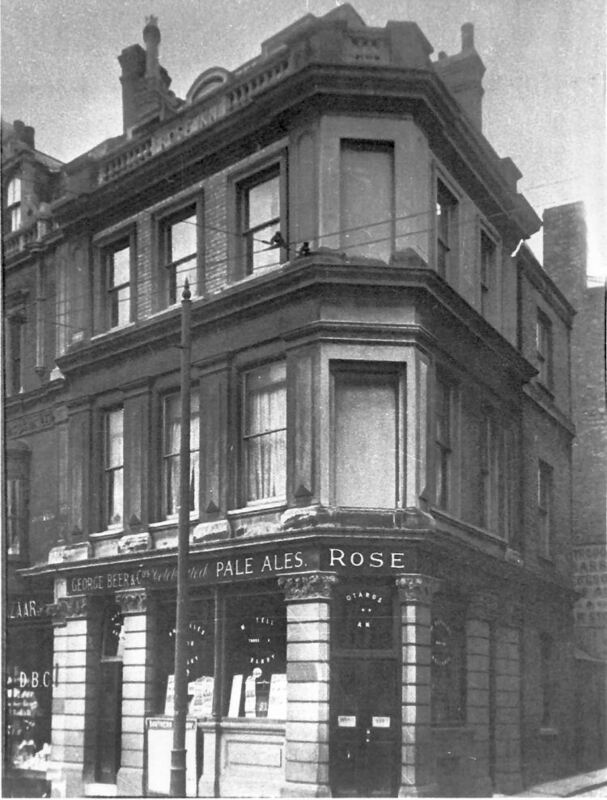 George Clark, the landlord of the "Rose Inn," Canon Street, appeared in answer to a summons which had been served on him for using threatening language towards James Powell; but the complainant not appearing, the Bench dismissed the case. From the Dover Express and East Kent News, Friday 5 September, 1873. William Charles Wilson applied that the license of the “Rose” might be transferred to him. The Superintendent of Police said he believed the applicant was at one time the landlord of the “Grapes;” and had been convicted for selling liquor during prohibited hours. It appeared that the conviction to which the Superintendent alluded occurred some four years since, the Magistrates granted the transfer. From the Dover Express and East Kent News, Friday 15 May, 1885. Price 1d. John Hubert Parsons was charged with assaulting Albert Stokes on the 6th of May, and also with breaking windows and doing damage to the amount of 10s. The prosecutor, a poulterer, living in new Street, said: On Wednesday evening last, about ten o'clock, I was in the “Rose” public-house, which is kept by the defendant. I was talking to a woman, who said she was born in Africa. A man said, “That is a lie,” I told her it was Mr. Ralph. Shortly after defendant came in. She told him what I had said, and he came and struck me in the face. I went outside to my wife, and defendant followed me up to my house. He broke all the windows at the bottom of the house with his fist. He also broke the door post. I am doubtful if 10s. will pay for all the damage done. Defendant said that he did not break the windows, although he admitted going to the house. The Bench fined defendant 10s. for assault, 8s. 6d. costs, and 10s. for damage done, and costs, amounting in all to £2 7s. The money was paid. 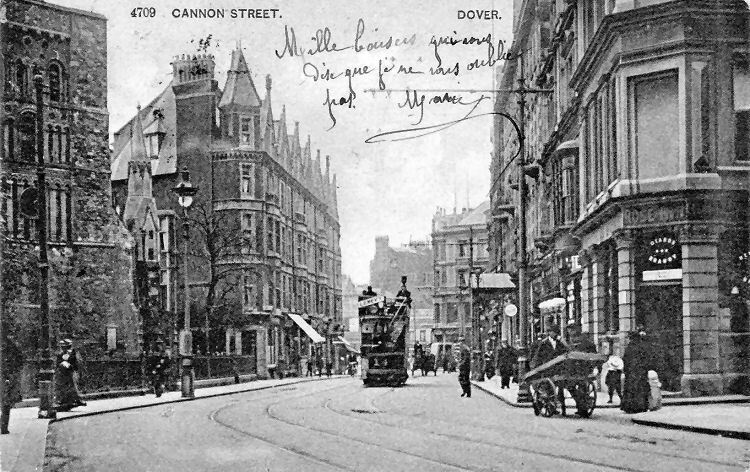 Road widening was spoken about in October, 1891 when a Common Hall called on the town council to widen the main thoroughfare; and parliamentary power for that purpose was obtained in 1892. 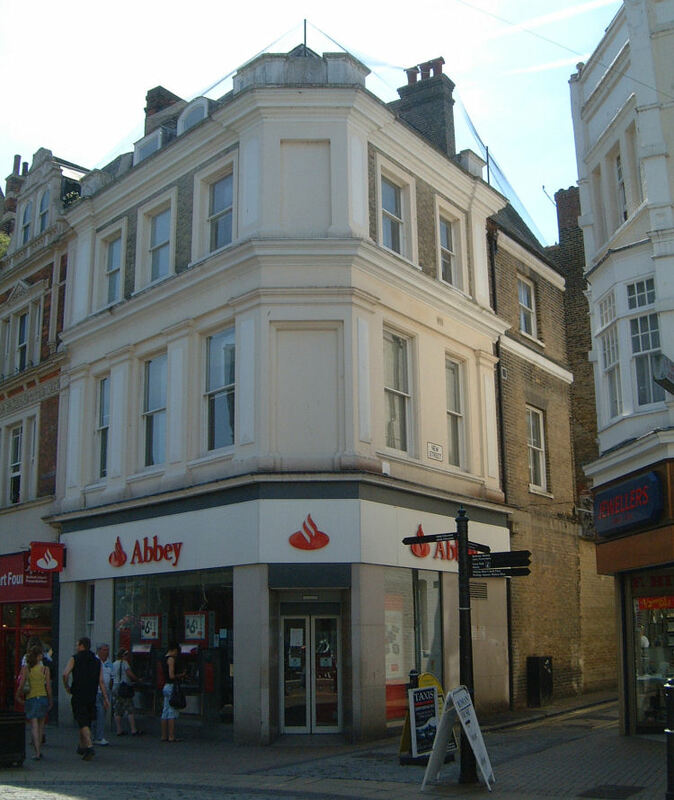 In due course, negotiations were entered into, and the property on the west side of the street was purchased obliging Dover Corporation to purchase the property, including the stables, for £1,594.6s. We know that following that widening, the pub was rebuilt on the corner with New Street. Quite quickly too. Bourner was the licensee from 1895. The widening of the road went from the "Rose" Inn down as far as Bryson's Bakery, for which slice £24,201 28. 1d. was paid. The new pub was fed latterly by Whitbread-Fremlin but closed finally on 13 January 1973. 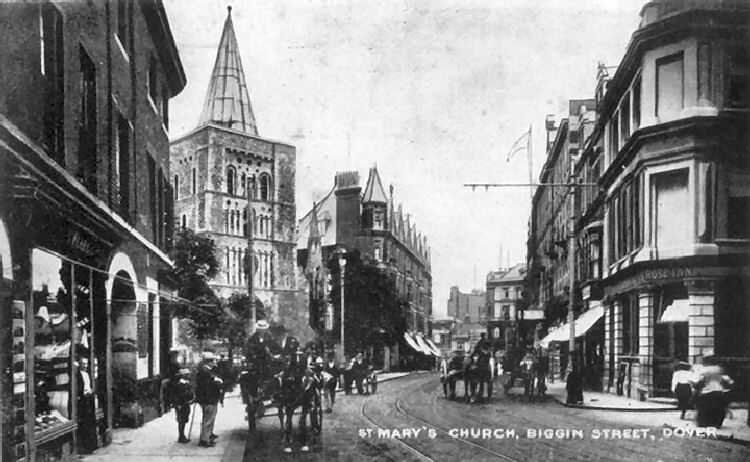 The premises were then altered to accommodate a building society, another stone concerning Biggin Gate taking its place in the side wall. From the Dover Express and East Kent News, Friday, 24 August, 1900. Price 1d. John Holmes was charged with being drunk and disorderly in the market Square and in Cannon Street. Acting Police Sergeant Scutt said that the prisoner, who was very drunk, came up to witness who was in uniform ion the market Square, and asked for a 1d. for half a pint of beer. Witness asked him if he took him for a kitten, and told him to go off to his lodgings. He saw the defendant stop two gentlemen afterwards, and witness told him if he did that again he should take him into custody. He shouted very loud and went into the “Rose Inn.” He was ejected from there, and was taken into custody. The prisoner, who had been before the Magistrates the previous day, asked the Magistrates to send him to Canterbury. The magistrates decided to oblige the man, and sent him to Canterbury Prison for seven days' hard labour. From the Dover Express and East Kent News, Friday, 7 October, 1904. Price 1d. The plans of some small alterations to the "Rose Inn," Cannon Street, were approved. From the Dover Express and East Kent News, Friday 27 September, 1912. At the Dover Police Court on Tuesday, before Messrs. W. W. Burkett (in the chair) and J. Scott. Albert Cansfield, of no fixed residence, was charged with stealing, whilst in the public bar of the "Rose Inn," Cannon Street, from the jacket pocket of Thomas Wakerall, 8, New Street, a purse containing about 10s. in money, the property of Thomas Wakerall, fruit seller. Thomas Wakerall, a fruit dealer, living at 8, New Street, said: Yesterday afternoon between 1 and 1.30, I was in the public bar of the "Rose Inn," Cannon Street. Here were four or five others in the bar and the prisoner also came in. I was about to call for a drink and put my hand into my left-hand pocket for my purse, but found that it had gone. I had between 10s. and 15s. in silver and copper in the purse. I asked the other chaps if they were having a joke with me, I had previously been in conversation with them and the prisoner in te bar. "Sandy" Allison said he had not been joking, but had suspicions. I left the bar and went to the kitchen of the "Eight Bells" lodging house. I there saw the prisoner who was asleep, I at once came to the Police Station, reported the matter, and went back to the kitchen with P.C. Detective Southey. He took prisoner into the yard, searched him, and found the purse (produced) upon him. The purse was thus empty. Prisoner was under the influence of drink when I saw him at the bar of the "Rose Inn." he is a stranger to me. He was brought to the police station and charged. Detective P.C. Southey said: Yesterday, about 4 p.m. I accompanied the last witness to the "Eight Bells" lodging house, 8 New Street. I there saw prisoner, who was asleep in the kitchen and the last witness pointed him out to me as the person who he suspected of having stolen his purse. I aroused prisoner, called him into the yard, told him I was a police officer, cautioned him and told him that he was suspected of having stolen the purse containing about 15s., the property of Thomas Wakerall. I asked him what money he had about him, and he put his hand into his jacket pocket and produced five-pence in coppers. Not feeling satisfied I put my hand into his watch pocket and pulled out 9s. 6d. in silver. He previously put his hand into that pocket before he produced the five-pence, and I heard the money rattle. In another waistcoat pocket I found the purse (produced) which Wakerall identified as his property. I told prisoner I should take him into custody, and then I brought him to the Police Station. At the Police Station I found another penny and a farthing, on the prisoner, making 10s. 0½d. He was charged with stealing a purse and about 10s., and in reply said "On the face of it I am not guilty, and that's done with it." Prisoner on formally being charged, said he wished the case to be dealt with summarily, and pleaded guilty. He said he was under the influence of drink at the time, or he should not have done such a thing. He had no other excuse to make. He did not want money, as he had some. The Chairman said he saw prisoner was classed as an orderly. Prisoner: I am really a ship's steward. I have no fixed residence. I come from York, and came straight from Folkestone to Dover on Friday. I last sailed in March at Liverpool. Detective P.C. Southey said in the morning prisoner had been seen with hand in handkerchief selling postcards. There was nothing the matter with prisoner's hand. Prisoner said there was something the matter with it. The Magistrates committed prisoner to three weeks' hard labour, and ordered the purse and money to be returned to Wakerall. 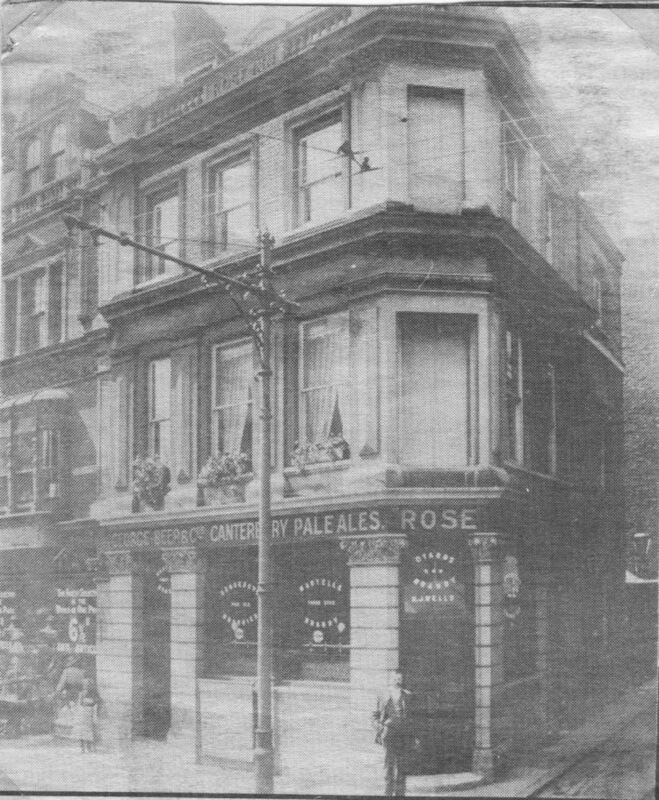 The licence of “ The Rose,” Cannon Street, was transferred from Mr. Wells to Mr. Hilton. Dover Express, Friday 22 September 1939. Frank Monk, the "Rose Inn," Cannon Street, who pleaded guilty, was also fined 10s. for allowing light to be emitted when the bar doors were opened at 8:30 p.m. on September 3rd. Chief Inspector Saddleton said that defendant told P.C. Page he would screen the lights as soon as he could get the materials. Dover Express. 22 July, 1949. When a local man was fined for stealing a glass from a public house, Dover magistrates on Friday complimented Sgt. Reid on his prompt action in arresting the man after he noticed him carrying the glass in the main street late at night. The man, James Murray, of Squires Way, pleaded guilty to stealing a pint glass mug from the "Rose Inn," Cannon Street, the property of Herbert Osbourn Morrison, on July 7th. Inspector Piddock said that at 10.30 pm. Sgt. Reid saw defendant, who was carrying something in his hand, with two other men in Cannon Street. When the officer approached defendant turned away and when he turned back he had nothing in his hands but there was a bulge in his coat. When he was questioned he said he was taking the mug home for drinking purposes, and indicated the "Rose Inn" as the public house from which he had stolen it. The officer took him to the inn, where the licensee identified the glass as his property and defendant as a man who had been in the bar with two others. On defendant's own behalf, said Inspector Piddock, it was fair to say that although he was not drunk he had had "a lively evening." The Chairman, (Mr, G. D. Clark) announcing a fine of £1 said the Bench hoped it would teach defendant a lesson, and others as well. 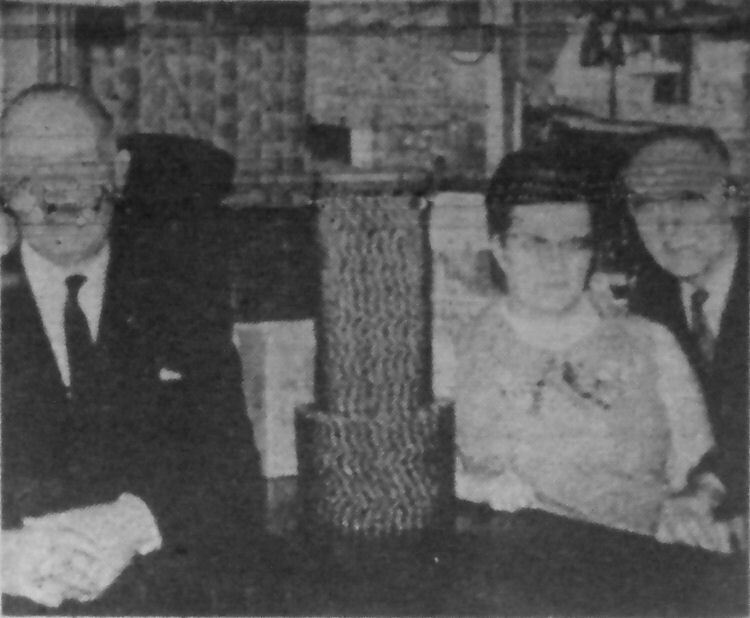 From the Dover Express and East Kent News, Friday 12 March, 1971. Eight thousand six hundred and forty pennies came tumbling down at the "Rose Inn," Cannon Street on Friday - to help the Senior Citizens Riverside Centre. It happened on Friday when Alderman Arthur Husk vice-chairman of the Trust committee and Mr. Wilf Farringdon the organiser were invited to demolish the pile. The final count was £36. Alderman Husk thanked the landlord and his wife, Mr. and Mrs. John Hutley and their customers for their generosity. He said the cash would buy extra tables. Above photo by Paul Skelton, 19 August 2009, showing the "Rose" as it is today. It was reported by the Dover Express 1908 that when the transfer from Henry Grindle to Frank Kemp(Kidd?) was applied for at the magistrates court, it was stated by Mr. K. A. K. Mowll that the outgoing tenant was too ill to attend.